AWS stands for Amazon Web Services. The AWS service is provided by the Amazon that uses distributed IT infrastructure to provide different IT resources available on demand. It provides different services such as infrastructure as a service (IaaS), platform as a service (PaaS) and packaged software as a service (SaaS). Amazon launched AWS, a cloud computing platform to allow the different organizations to take advantage of reliable IT infrastructure. A small manufacturing organization uses their expertise to expand their business by leaving their IT management to the AWS. A large enterprise spread across the globe can utilize the AWS to deliver the training to the distributed workforce. An architecture consulting company can use AWS to get the high-compute rendering of construction prototype. A media company can use the AWS to provide different types of content such as ebox or audio files to the worldwide files. Based on the concept of Pay-As-You-Go, AWS provides the services to the customers. AWS provides services to customers when required without any prior commitment or upfront investment. 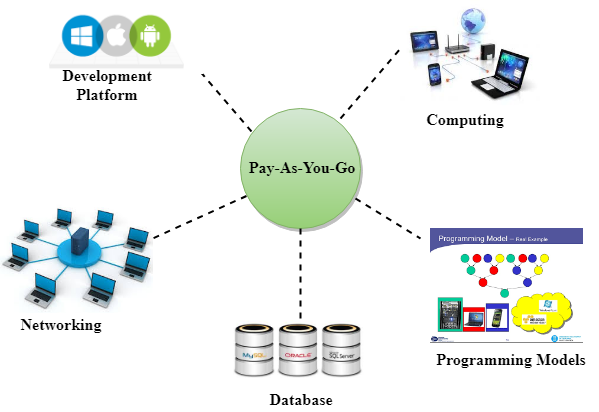 Pay-As-You-Go enables the customers to procure services from AWS. We can get more time for core business tasks due to the instant availability of new features and services in AWS. It provides effortless hosting of legacy applications. AWS does not require learning new technologies and migration of applications to the AWS provides the advanced computing and efficient storage. AWS also offers a choice that whether we want to run the applications and services together or not. We can also choose to run a part of the IT infrastructure in AWS and the remaining part in data centres. AWS requires no upfront investment, long-term commitment, and minimum expense when compared to traditional IT infrastructure that requires a huge investment. Through AWS, autoscaling and elastic load balancing techniques are automatically scaled up or down, when demand increases or decreases respectively. AWS techniques are ideal for handling unpredictable or very high loads. Due to this reason, organizations enjoy the benefits of reduced cost and increased user satisfaction. AWS provides end-to-end security and privacy to customers. AWS has a virtual infrastructure that offers optimum availability while managing full privacy and isolation of their operations. Customers can expect high-level of physical security because of Amazon's several years of experience in designing, developing and maintaining large-scale IT operation centers. AWS ensures the three aspects of security, i.e., Confidentiality, integrity, and availability of user's data.